Thanks to the linear modular design and the individual modules functions, any configuration of machine can be created outside the standard machines range to suit specific requirement such as filling mixes of solid and liquid products. Special versions are usually extended machines with extra space for multiple or large product dosing units or even manual filling of some difficult shape products. Unlimited product combinations are therefore made possible on Linapack LFS linear concept machines. This is particularly interesting for product mixes that require individual dosing of several products in order to maintain the right amount of each component (ready made dishes, sauces, confectionary, etc.). 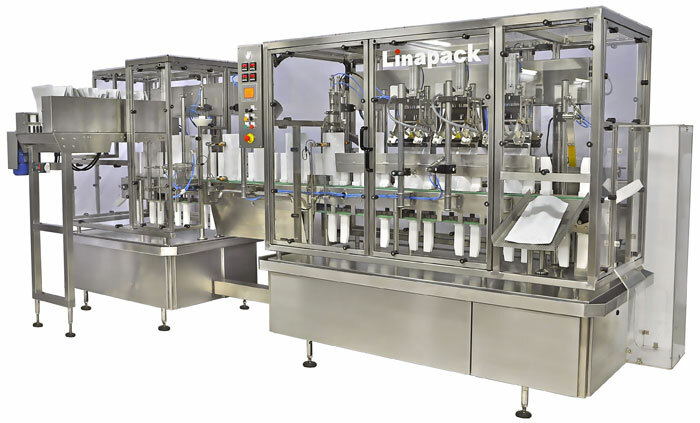 Companies with a wide variety of products to fill may also enjoy multiple dosing systems on a single machine that can be enabled or disabled without the need to move then around. and automatic liquid filling. Maximum speed 90/min. automatic liquid filling and Nitrogen flushing. Maximum speed 30/min.